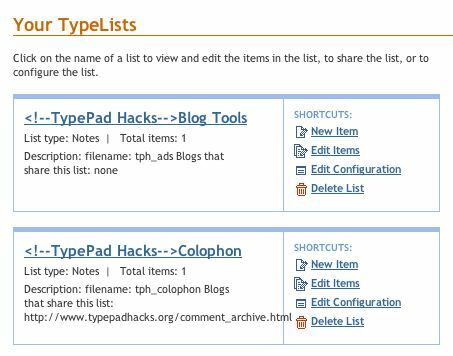 The "Your TypeLists" page should display the file name used by the system to identify the TypeList in advanced templates. When you first create a TypeList, the filename is based on the name you provide (which becomes the title of the TypeList). If you later change or edit the title, the filename remains unchanged. A year or two goes by, and you forget that the original TypeList name was something else altogether. If you create a TypeList with the same name as an existing TypeList, the system will name the new one filename_1. This can get really thorny if you have a lot of TypeLists with the same name (for instance, four blogs that all have a TypeList titled "Info"). Names with spaces will be dirified (an underscore is substituted for spaces between words). TypeList filenames are case sensitive (they are always lowercase, regardless of whether you capitalize the list name). In the past, the way I've dealt with this is to create a new blog, add the TypeList to it, convert to Advanced Templates, copy the include code for the new TypeList from the sidebar template of the new blog and paste it into the one I'm working on. Then I go back and delete the new blog and it's templates. It's a pain, and it's kind of labor intensive. I figured, there's gotta be a better way. In fact, there are several better ways. This directory is invisible from your home folder in the Files tab (although the breadcrumb trail above the directory shows that it is hosted there). So you pretty much have to manually load the URL to view this. I suggest bookmarking the page if you think you'll need it again. Unfortunately, this will not always solve your problem if you've changed the title of a list radically enough that you no longer recognize the old filename. The better methodology is to plan ahead as described in the next section. All lists will be named blogname_function (i.e. typepadhacks_subscribe). Before I add it to the blog, I can edit the title to read as desired (i.e. Subscribe). When I convert the template, I'll copy the TypeList filename into the Description Field right away, before I forget what it is or change the title. If at any time I add an existing TypeList to an additional blog, I'll note that in the Description Field. That way if I remove it from the original blog, I won't accidentally delete the TypeList while it's still in use elsewhere. Of course, once you know the filename of your TypeList, it's easy to include it into an Advanced Template blog: Just open the Sidebar Template, copy the code that brings in an existing typelist and replace the old filename with the new one. Easy! I am not sure whether this post relates to what i am trying to do but I am a litle stuck and would appreciate your advice. I am trying to display a Typelist using custom css and having it display with a different name to the actual Typelist Name. ie. I have a Typelist called "Rattle International" and rather than the module header displaying "Rattle International" I just want it to display "International". I can get it to display OK but it does not display as per every other Typelist on the page and I have spent hours and been speaking to Typepad and I cant work it out for the life of me. I am only a self taught coder so it is probably obvious.